This thermostat is very simple to use. Just press the up arrow to set the temperature (in 0.1 degree increments). There is a flame indicator on the screen that shows when the heater is operating. The unit has an 18 inch remote sensor that is placed inside the incubator. The white thermostat case is then mounted on the outside of the incubator. Finally you can measure the temperature right next to your eggs, not the air at the top of the incubator. Temperature Switching Differential = 0.2 degrees Fahrenheit. This means if the thermostat is set to 99.5 the thermostat will turn the heat on when the thermostat sensor reads below 99.3 and turn off when the sensor reads above 99.7. NOTE: It is normal for the thermostat to turn the heater off and still have the air temperature increase a little bit. This happens because as the power to the heater turns off, the heater is still hot and will heat the air around it. The same is true when the heater turns back on: the temperature may decrease a little more as the heater gets back up to temperature. The amount this happens will depend on the thermal mass of your heating element and the amount of circulation in your incubator. Keep in mind that the air temperature may vary without a negative impact to the eggs if the variation is rapid enough to not allow the egg to heat or cool more than it should. As long as the up and down cycle is relatively small, is less than a few minutes, and the average air temperature is at your target temperature, the temperature inside your egg (which is what really matters) will be just fine! This is true with any incubator and egg configuration. Wiring and operation instructions included. It also includes instructions for installing an incubator fan, if desired. Key lock feature allows you to set the temperature and lock the keys so it cannot be changed without unlocking the keys (keys are locked by pressing both up and down buttons for 5 seconds). IncuStat Advanced for IncuKit XL. This device lets you add a sophisticated control module to your cabinet (or larger-style) egg incubator. 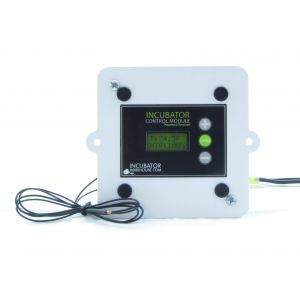 This is designed to control the temperature, air circulation and automatic turner motors in your incubator. NOTE: if your incubator needs more power than 300 watts, you have the option of using a heater that is always on in order to bump up the entire wattage inside the incubator. 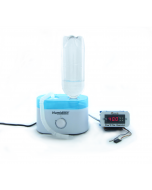 For example, if you think you will need about 350 watts for your incubator, you can put a 60 watt light bulb inside the incubator that is always on. Then when the heater that you are regulating with the thermostat is on, you will have enough power in your incubator. Feel free to contact us if you would like further clarifications about this option. What is the difference between a proportional thermostat and an on/off thermostat? An off/off style thermostat turns the heater on full power when the temperature gets too low. Then it turns it completely off when the temperature gets too high. This style creates a wider swing in temperature because the temperature has to get too high or low before the thermostat responds. The proportional style thermostat adjusts the power up and down as the temperature starts getting close to the set-point (your target temperature). It will reduce the amount of power going to the heater as the temperature gets close to the set-point. Then it will increase the power as the temperature starts falling away from the set-point. 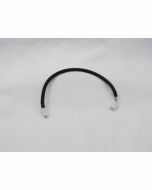 This allows the temperature swing to be much less than the on/off style thermostat. When incubating eggs, accuracy counts! That is why a proportional style thermostat is preferred. 220 Volt International Version. Click here to see the 110 North America Version. The IncuKit XL ™ is an all-in-one kit designed to be the heart and brains of a homemade cabinet incubator. It allows you to convert a cabinet-sized enclosure into an incubator! To make your own incubator, you can use anything from an old refrigerator to a custom built cabinet! Simply choose your enclosure and install your IncuKit XL™ unit inside. Pretty cool? Well, actually it's pretty hot and it works very well. The IncuKit XL™ series has been redesigned to provide you with more options and versatility! Basic Thermostat module: This is a standard on/off thermostat. This means that when the temperature hits a certain point, it turns the heater off and then back on full power once the temperature drops below a certain point. It will control the heater and fan. 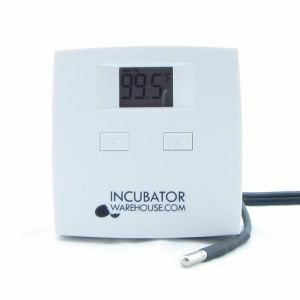 This comes pre-set to 99.5 degrees F.
The number of heater and fan modules will be determined by the size of your container, how well it is insulated and the temperature outside the incubator. The IncuKit XL™ can be configured with one or two heater and fan modules, depending on these factors. Each heater and fan module will provide 125 watts of power. For medium size containers this may be all you need. 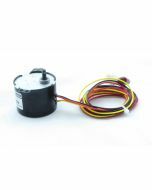 For larger containers, you can add a second module to add an additional 125 watts of power. Do determine which option is best for you, a simple light bulb test will help. Get light bulbs that will generate enough heat to easily warm your incubator to at least 100 degrees F. See how many watts are required and that will help you know which option to select. The buyer is responsible for determining if this will generate enough heat for your enclosure. Caution: this is an AC powered device that you will be mounting in your incubator yourself. You must use a great deal of common sense when dealing with electrical devices. Electricity is wonderful but can be very dangerous. Use caution, common sense and if in doubt, ASK AN EXPERT!!! Easy to install and set up. All mounting hardware needed is included. And our step-by-step video makes it easy to install. Just mount the heater and fan module, mount the thermostat, connect them together and then plug it in. It's so easy!! 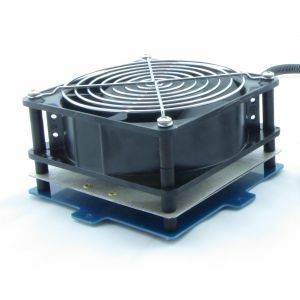 If you find that your particular incubator needs more air circulation (a common issue in odd-shaped incubators), we offer 92mm and 120mm AC fans.